Product prices and availability are accurate as of 2019-04-23 04:55:26 EDT and are subject to change. Any price and availability information displayed on http://www.amazon.com/ at the time of purchase will apply to the purchase of this product. Baxton Studios Espresso One-Drawer TV Stand is a handsome addition to a living room or bedroom. 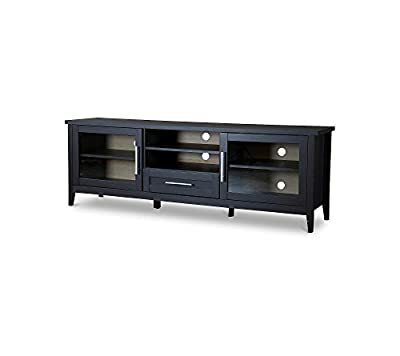 Study and well-made, this flat stand offers pre-drilled cable holes for convenience and a pull-out drawer to neatly hold your remotes, DVD's and accessories. Sleek, space-saving and modern, this dark brown stand with contrasting silver handles is sure to please.